MANILA – At 6:30 a.m. on Sunday, June 19, Arcata firefighters responded to a structure fire at 1737 Laurel Street in Manila. On arrival, firefighters found a 1,000-square-foot residence well-involved in flames and well-concealed by the bay fog. The owner, Robert Riley, who resides in another residence on the property, awakened to the crackling sound of the fire and discovered the building in flames. Riley called 911 and initiated a fire attack with a garden hose, to no avail. 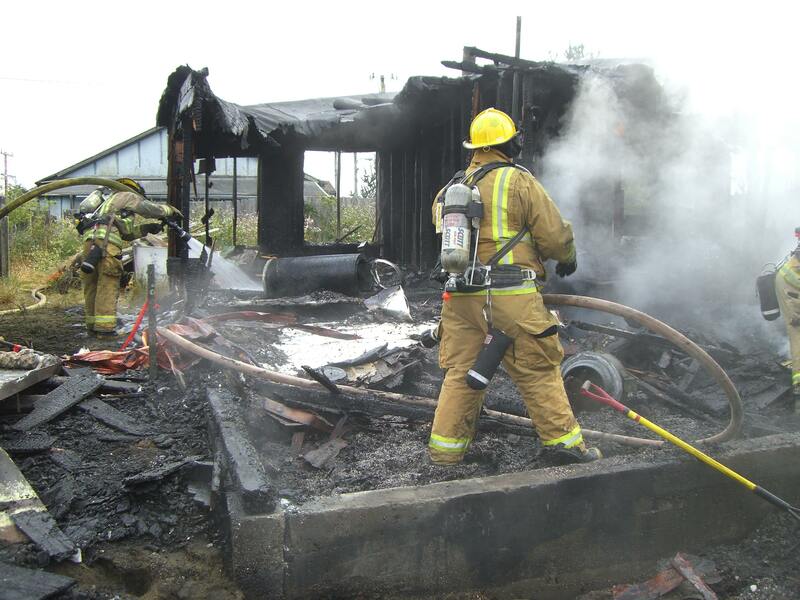 Eureka firefighters joined Arcata in suppressing the flames, but not before the building was rendered a total loss. Blue Lake and Fieldbrook firefighters checked the building later in the afternoon and found the fire to be out. Then, at 5:52 p.m., firefighters again responded to the same address – this time for a grass fire that could be seen from downtown Arcata. Responding units reported a smoke plume stretching from Manila to Murray Field. This time, firefighters arrived to a quarter-acre grass fire that was involving a debris pile approximately 50 feet from the previously burned residence and an abandoned mobile home on the property. The owner had rechecked the area for any signs of a rekindle at 5 p.m. and departed for shopping in Eureka. Upon return, he noted the smoke from the Samoa bridge and arrived home to discover the second fire in the debris pile. Again, Riley called 911 and initiated another fire attack with his garden hose – also to no avail. Firefighters were joined by Eureka and Samoa to extinguish the blaze while Blue Lake and Fieldbrook again covered Arcata’s stations until 9 p.m. The residence was utilized as a “215” marijuana grow operation, and although the original fire remains unsolved, the point of fire origin is in the area of the building’s main electrical service. The second fire appears to be the result of an ember escaping undetected from the first fire and smoldering in the debris pile for hours until the effects of the sun and wind kindled the fire. This entry was posted on Tuesday, June 21st, 2011 at 9:02 am	and is filed under News. You can follow any responses to this entry through the RSS 2.0 feed.